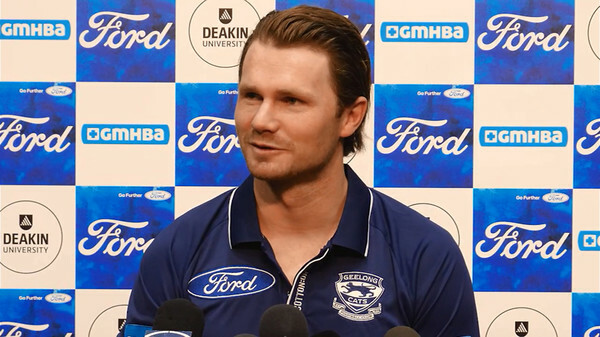 IMPATIENT: Cats star Patrick Dangerfield has urged his teammates to be desperate for success. Patrick Dangerfield has urged Geelong’s younger players to be “impatient” as the club chases its 10th premiership. “I’m an impatient person, and all our leaders are because they understand that the end is closer than the beginning,“ Dangerfield said of the hunt for a flag on Tuesday. Geelong added eight new players at the AFL draft and rookie draft. Jordan Clark was taken at pick 15 and the West Australian is a good user of the ball out of defence. Clark battled glandular fever, but is seen as a line breaker who distributes the ball cleanly. Clark is seen as a potential round one starter, but said he is happy to learn his craft for as long as it takes. The Cats selected South Australian Ben Jarvis with their next pick at 48. Jarvis is a 189cm forward who reads the play well and has a “terrific leap” according the list manager Stephen Wells. Jarvis had 17 disposals, four marks and three goals against Western Australia in the NAB AFL Under-18 Championships. Two selections later Geelong selected Jarvis’ Norwood teammate Jacob Kennerley. Kennerley is a smooth-moving 186cm wingman who can also play across half-back and possesses endurance. Kennerley broke the AFL Draft Combine record for the 2km time trial – running 6:04 minutes. Another South Australian, Darcy Fort, was taken by the Cats at number 65. Fort is a mature aged recruit from Central Districts and is a developing ruckman. The 25-year-old will head back to Geelong after playing for South Barwon in 2014. Jake Tarca was taken at pick 68. The small forward was yet another player taken from outside Victoria. Tarca plied his trade for South Adelaide and is 175cm tall and is a noted goalkicker with smooth foot skills on both sides of his body. The Cats used their final pick on father-son selection Oscar Brownless. Brownless was chosen at number 74 and is a versatile utility that can push forward or back or play in the midfield. Geelong took one rookie draft pick, Tom Atkins from its VFL squad. The 23-year-old is an inside midfielder who has won two VFL best and fairests and captained the Cats this season.